Only 1.4% of our joint-replacement therapy patients were re-hospitalized compared to the national benchmark of 5.2%. If you or a loved one is planning a hip replacement, knee replacement or other joint replacement surgery, after-care is just as crucial as a successful surgery. 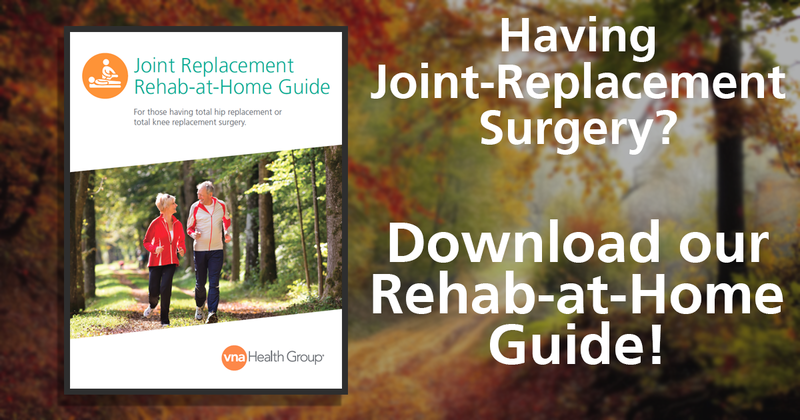 Rehab therapy at home is now the ‘Gold Standard’ for joint-replacement procedures because patients recover in their home environment, which reduces their risk of infections and re-hospitalizations. Rehabilitation plays a vital role in recovery from total joint replacement, and Visiting Nurse Association Health Group is pleased to offer in-home therapy to aid your recovery, improve mobility, range of motion, dexterity, and manage pain. Our specially trained therapists work with New Jersey residents to strengthen the bone and muscles around the replaced joint. Our patients have the option of using Connected Health software such as the Medocity Home Health app. Medocity gives you the ability to track your care, communicate with your VNA clinicians or doctor, provide updates to your caregivers, and full access to our “Physical Therapy at Home” video series to guide you in exercises you can perform safely at home between visits. While everyone needs outpatient therapy, not everyone can manage to drive back and forth to therapy. Our in-home joint replacement therapy ensures that post-surgical patients receive the rehabilitation needed to ease back into your regular daily activities and bounce back faster. Recovering at home has become the new gold standard of care among joint replacement patients. Patients that recover at home have a rehospitalization rate of just 1.4 percent!